I have been attempting to compose some sort of post for the past couple weeks about the recent worldwide celebrations in honor of the 60th anniversary of Israel's declaration of independence. I have yet to figure out exactly what I wish to say. Nothing seems to sum up how I feel about cheering the birth and life of an ethno-supremacist state that fronts as a true democracy. I have no new relevations to impart, nothing really to say that hasn't already been written about. I am at a loss. What is there to celebrate? To celebrate Israeli independence is to celebrate racism, terrorism, dehumanization, demonization, mass murder, death squads, ethno-religious supremacy, the expulsion, exile, and dispossession of a native people, the triumph of a 19th Century European imperial and colonial ideology and the exploitation of 3000-year-old mythology, oppression, subjugation, land and property theft, and sixty subsequent years of militarization, territorial expansion, settlement building and annexation barriers, house demolitions, economic strangulation and political disenfranchisement, apartheid-style legal policies and restrictions on movement, institutionalized segregation, the aggressive disdain for basic human rights, and the subversion and neglect of international law, including more than four decades of military occupation. To celebrate the birth of the state of Israel is to laud the catastrophe that befell the Palestinian people in 1947-48. There is no way to separate these two events. The national independence achieved by 20th Century Zionists is synonymous with the disaster (Al-Nakba) of deliberate and systematic ethnic cleansing of an indigenous population, whose land and lives were violently taken from them by the crusading settlers. This disaster is the root cause of the Israeli/Palestinian conflict, it is solely responsible for the Palestinian refugee crisis, and it is the main obstacle to peace and justice in the Middle East. To celebrate the "independence" of Israel is to condemn the strive for equality and co-existence. It is to commend collective punishment and deny collective memory. It is to praise Plan Dalet, to hail the Deir Yassin and Tantura massacres, and to legitimize the genocidal and brazen words and actions of Israel's founders, such as its first Prime Minister David Ben-Gurion who said, "We must use terror, assassination, intimidation, land confiscation, and the cutting of all social services to rid the Galilee of its Arab population." That the state of Israel was created through the most vile of means and for the most ethnocentric of reasons is not controversial. Historians, both Israeli and international, do not question the facts. It is only here in the United States that Israel's founding myths have persisted. A letter to the Guardian (UK), signed by over one hundred British Jews, explains very clearly why the 60th anniversary of Israel's creation is no cause for festivity, but rather should be that of the recognition of the historical and cultural narrative of "the other," to commemorate the loss and mourning of those to whom a grave injustice has been done and to whom injustices continue, crimes against humanity such as ethnic cleansing and total occupation, that occur in plain sight on a daily basis, to acknowledge the strength, achievement, and unflagging perseverance of a desperate and tormented people, and hopefully to serve as an rallying cry to make right what has, for so long, been wrong. Again, these facts are not disputed. They are not up for interpretation. They are historical events and not questioned by any experts or authorities, despite Zionist efforts to rewrite, disguise, and twist the facts of the story to serve their racist ideologies, policies, and desires. Israel denies Palestinians the right to return to their land, despite the demands of international law. A 75-year old Palestinian woman is not allowed to visit the village in which she grew up, yet a 19-year-old Jewish girl from Brooklyn is automatically deemed to be a citizen of Israel and can travel anywhere in the "Jewish" state that she pleases, sometimes even for free. What is there to celebrate? "...in resisting the Nakba, the Palestinians have struck at the heart of the Zionist project that insists that the Nakba be seen as a past event. In resisting Israel, Palestinians have forced the world to witness the Nakba as present action; one that, contrary to Zionist wisdom, is indeed reversible. This is precisely what galls Israel and the Zionist movement. Israel's inability to complete its mission of thoroughly colonizing Palestine, of expelling all Palestinians, of "gathering" all Jews in the world in its colony, keeps it uneasy and keeps its project always in the present continuous. While Israel has used this situation to project itself as a victim of its own victims who refuse to grant it legitimacy to victimize them, Israel understands not only in its unconscious but also consciously that its project will remain reversible. The cruelty it has shown and continues to show to the Palestinian people is directly proportional to its belief in their ability to overthrow its achievements and reverse its colonial project. The problem for Israel is not in believing and knowing that there is not one single place in its colonial settlement that did not have a former Arab population, but in its realization that there is no place today in its imaginary "Jewish State" that does not still have an Arab population who claims it. That the Nakba remains unfinished is precisely because Palestinians refuse to let it transform them into mankubin. [The Arabic term mankubin is explained earlier in Massad's piece thusly: "English does not help much in translating mankubin, unless we can stretch the language a bit and call Palestinians a catastrophe-d or disaster-ed people."] What we are witnessing at this year's commemorations, then, is not only one more year of the Nakba but also one more year of resisting it. Those who counsel the Palestinians to accept the Nakba know that to accept the Nakba is to allow it to continue unfettered. Palestinians know better. The only way to end the Nakba, Palestinians insist, is to continue to resist it. With this in mind, perhaps there can still be a hopeful future that sees human rights honored and justice done. Now wouldn't that be something to celebrate? This month Israel marks the 60th anniversary of its founding. But amidst the festivities including visits by international celebrities and politicians there is deep unease -- Israel has skeletons in its closet that it has tried hard to hide, and anxieties about an uncertain future which make many Israelis question whether the state will celebrate an 80th birthday. Official Israel remains in complete denial that the birth it celebrates is inextricably linked with the near destruction of the vibrant Palestinian culture and society that had existed until then. It's not an unfamiliar dilemma for settler states. The United States, where I live, has found that even the passage of centuries cannot absolve a nation from confronting the crimes committed at its founding. As the noted Israeli historian and staunch Zionist Benny Morris put it in 2004, "a Jewish state would not have come into being without the uprooting of 700,000 Palestinians. Therefore it was necessary to uproot them." He went on, "there are circumstances in history that justify ethnic cleansing." But if one is not prepared to openly justify ethnic cleansing, there's only two real options: to deny history and take comfort in an airbrushed story that paints Israelis as brave, divinely inspired pioneers in a desert devoid of indigenous people and beset by external enemies, or to own up to the consequences and support the enormous redress needed to bring justice and peace. Just before Israel's founding, Palestinians of all religions made up two thirds of the settled population of historic Palestine, while Jewish immigrants, recently arrived from Europe, made up most of the rest. Among those uprooted was my mother, then nine years old. Now living in Amman, she remembers a happy childhood in her native Jerusalem neighborhood of Lifta. My grandfather owned several buildings and many of his tenants were Jews, including the family who rented the downstairs apartment in their house. 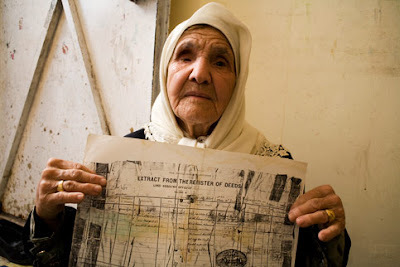 Early in 1948 -- before any Arab states' armies got involved -- she and her entire family, indeed all the inhabitants of several neighboring West Jerusalem areas, were forced out by Zionist militias. On 7 February that year, Israel's founding prime minister, David Ben-Gurion told members of his party, "From your entry into Jerusalem, through Lifta-Romema, through Mahane Yehuda, through King George Street and Mea Shearim -- there are no strangers [i.e. Arabs]. One hundred percent Jews." So it was that the Palestinians became "strangers" in the land of their birth. Since that time millions of refugees and their descendants who lost their homes, farms, groves, livestock, factories, stores, tools, automobiles, bank accounts, art work, insurance policies, furniture and every other possession have lived in exile, many in squalid refugee camps maintained by Israel and Arab states. Over 80 percent of the Palestinians now besieged and starved in the Gaza Strip are refugees from towns now in Israel. But what Palestinians could never be forced to part with -- and this we do celebrate -- is our attachment to our homeland and the determination to see justice done. Palestinians all over the world are commemorating the start of our ongoing tragedy, but we are also looking forward. We are at an important turning point, where two things are happening at once. First, despite ritual declarations of international support, the prospect of a two-state solution has all but disappeared as Palestinians in the West Bank and Gaza Strip are caged into walled reservations by growing Israeli settlements and settler-only roads -- a situation that resembles the bantustans of apartheid South Africa. Second, despite Israel's efforts to keep Palestinians in check, the Palestinian population living under Israeli rule is about to exceed the five million Israeli Jews. Today there are 3.5 million Palestinians in the West Bank and Gaza Strip, and another 1.5 million Palestinians who are nominally citizens of Israel. Sometimes called "Israeli Arabs," Palestinians in Israel are increasingly restive about their second class status in a Jewish state that regards them as a hostile fifth column. While Palestinians in Israel call for equal rights in a state of all its citizens, some Israeli Jewish politicians threaten them with expulsion to the West Bank, Gaza Strip or beyond. Official projections show that by 2025, Palestinians, due to their much higher birth rate, will exceed Israeli Jews in the country by two million and though few in the international community have woken up to this reality, a surgical separation between these populations is impossible. Israeli leaders understand what they are up against; Prime Minister Ehud Olmert said last November: "If the day comes when the two-state solution collapses, and we face a South African-style struggle for equal voting rights, then, as soon as that happens, the State of Israel is finished." This struggle has already begun as more and more Palestinians, recognizing that statehood is unrealistic, debate and adopt the one-state solution, offering Israelis and Palestinians equal rights in the land they share. Last year, I was part of a group of Palestinians, Israelis and others who published the "One State Declaration." Inspired partly by South Africa's Freedom Charter, we set out principles for a common future in a single democratic state. Most Israelis, unsurprisingly, recoil at comparisons with apartheid South Africa. The good news for them is that the end of apartheid did not bring about the disaster many feared. Rather, it was a new dawn for all the people of the country. Co-founder of The Electronic Intifada, Ali Abunimah is author of One Country: A Bold Proposal to End the Israeli-Palestinian Impasse (Metropolitan Books, 2006). A version of this essay was originally published by The Sydney Morning Herald.